Charles Schwab has a 40 year history of advice and brokerage, so it’s no surprise that the backbone of its online offering is its research material from its staff of 25 who provide market commentary and analysis. Its own in-house content is complimented by a deal of independent content, making this one of the better offerings for such content. Schwab provides an in-house equity rating to stock summary screens, the only broker to offer such, though unlike Fidelity and TD Ameritrade it doesn’t include a consensus view. Before trading became available online, Schwab made its name by being a local financial expert and broker. It now has over 500 branches around the United States, as well as locations internationally. This background of customer facing activity has been taken forward into the virtual world, and the firm has been voted at the top of J.D. Power’s Satisfaction with Self Directed Investment Firm Survey in 2012, just ahead of competitors Vanguard and Scottrade. The other advantage of using Schwab with its network of locations is that you can visit them at any time – in fact they welcome it. I their offices you can talk to investment professionals, and deposit and withdraw funds from your account. This level of face-to-face service just isn’t available from companies such as Etrade and Trade King. With such a long history, it’s only natural that Schwab should have a pretty good idea what clients require from a broker. The company offers customer accounts that range from IRA through to retirement and active trading. Most of these accounts can be opened free of fees. It also offers services that encompass trust and estate planning, education savings, and other investment products. Its brokerage accounts require a minimum balance of $1,000, and give access to stocks, ETFs, options, and mutual funds. For those wishing to transfer accounts from elsewhere, Schwab often offer incentives such as IRA bonuses and transfer fees paid. IRA accounts also benefit from no maintenance or inactivity fees. Mutual fund trading charges seem expensive at first, though the funds that take part in its OneSource offering incur no dealing charges. Otherwise, the cost to buy fund is $76. That’s hefty, but you claw some of this back when selling as no cost is incurred. This brings the comparative round trip charge below Merrill Edge’s charge of $79.9 ($39.95 each way). There are minimum trading requirements needed to trade through the Schwab platforms –of which there are three – so if you don’t plan to trade at least 36 times per year, then you won’t have access to its trading tools. One of those tools is its team of active traders that offer support throughout the trading day, and are only a phone call away. The service you receive from them is matched by the service you receive when opening an account. A call within half an hour of completing the online application form is not unheard of, and the staff appears well versed, knowledgeable and courteous. You receive the same level of service if requiring a broker assisted trade. The commission to do so is the same as when trading online, but a service charge of $25 will also be levied, a reasonable charge and cheaper than Etrade’s average $45, though comparatively more expensive than Interactive Broker’s $0.01 per share charge for the same service (although IB does then add on all third party fees). For those traders that prefer to use charts to their full extent, then the Schwab charting tool is functional. It does, perhaps, lack the look and feel of other platforms, but is easy to use and settings used are automatically saved so that when the next chart is requested the parameters and data are equal. This makes fast and easy comparison a breeze. There are over 30 indicators that can be added to the chart, and notes can be added for later re-reading. 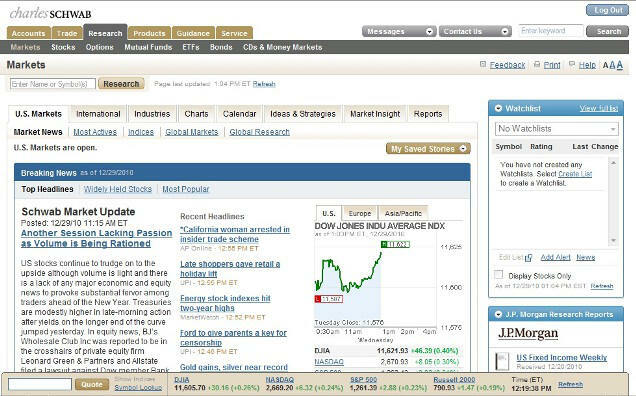 The mainstay of the Schwab offering is its StreetSmart.com web based workstation. Windows based, the screen can be customized and it’s easy to monitor positions, orders, and stock watchlists. Navigation is simple through its tab approach, and this means that you can separate research from orders should you wish. Schwab supports all order types, meaning great stock and order management, though its trader education falls below that of its competitors. Its possible to access just about every market a trader could want to trade, and account management is easy online, too. Schwab also offers a trading community forum, where active traders regularly exchange views and trading ideas, as well as interact with Schwab’s own traders. This is easy to use and well supported, comparing well to other such forums. The commission structure might not suit all. Stock trades are charged at a flat fee of $8.95, making the platform fairly expensive for active traders who trade smaller numbers of shares, but for those that trade a larger size and hold positions for a little longer then the knowledge that commissions are not linked to numbers of shares or value can be an advantage. Plus opening an account can be done with just $1,000, and then give access to one of the most comprehensive offerings of domestic and international stocks, options, and mutual funds available in the market place today. IRA dealing fees of $49 per trade are higher than many, but customers get the advantage of a fully rounded service and no ongoing IRA account fees. Overall, Charles Schwab’s platform is a good, solid offering for stock traders, with a cracking research facility, easy and direct order entry and management. It does what it says on the tin, and with a customer service department better than most, many would consider the slightly above average trading costs worth the money.